Fall in love with romance writer Meadow Taylor’s unforgettable characters in three heartwarming stories of finding, and keeping, true love. When Chloe Winters answers an advertisement seeking a private tutor for a six-year-old girl, little does she know that it means relocating from metropolitan Boston to an isolated mansion on a Newfoundland cliff overlooking the Atlantic Ocean. Nor does she realize that the little girl’s widower father is Gaelan Byrne, a billionaire alpha-male type whose brooding good looks have brought him as much fame as his wealth. Reminiscent of Charlotte Bronte’s Jane Eyre, The Billionaire’s Secrets combines classic contemporary romance in the tradition of Kristin Hannah and Nora Roberts with the dramatic Gothic landscape of Atlantic Canada, showing us the true meaning of strength, loss, and what it means to risk everything to find, and keep, true love. When Emily was eighteen, her mother died in an accident on their farm in rural Ontario. Devastated, Emily vowed never to suffer the loss of love again. She fled to Toronto and transformed herself from a farm girl into a sophisticated businesswoman. Now, ten years later, having made good in the big city, Emily is back to sell the family farm and put her past behind her forever. However, she didn’t count on finding Ray Storm, the farmhand she had nicknamed Rain as a child, more attractive than ever. Falling for Rain is a classic contemporary romance set against a picturesque country landscape. Olivia’s Christmas trip to Venice, Italy, should be a holiday dream come true. But when her unattended luggage becomes the focus of a handsome Italian policeman’s bomb investigation, she worries she won’t even make it out of the Marco Polo Airport. Practically handcuffed to the best-looking man she’s ever seen, can Olivia convince him she isn’t a terrorist before he writes her off for good? “Christmas in Venice” is the perfect little treat to start off the holidays with a smile. 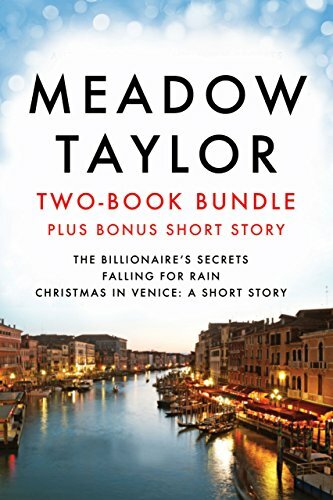 This short story is adapted from Meadow Taylor’s next full-length novel, Midnight in Venice.